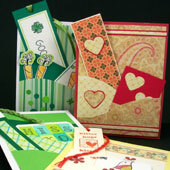 These greeting cards for your sweetheart feature pockets that you can fill with little tokens of your love. The pockets are also ideal for presents of money or gift cards. These cards are quick and easy to make using solid color cardstock and patterned papers that you can download and print. 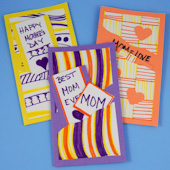 See the Pocket Cards tutorial for detailed instructions in making greeting cards with pockets. If you are new to card making, review the Greeting Card Class tutorials for ideas and basic techniques. For how to make card blanks and envelopes, see the Four Patch Cards tutorial or see the Envelopes to Make craft project for envelope templates and instructions. Optional: Rubber stamps and markers. Read through the instructions before starting. Scroll down to see the instructions for both card options. Both cards use digital paper that you download and print on white paper. These printed papers are combined with coordinating colored paper or cardstock. Prep work: Download Pastel Hearts ePaper and print on white paper. Cut a 4" by 5¼" rectangle from the Pastel Hearts ePaper and the orange cardstock. Cut two 4" strips of hearts from the Pastel Hearts ePaper. Cut two ½" by 4" strips of pink cardstock. Punch and stamp two hearts from the pink cardstock. 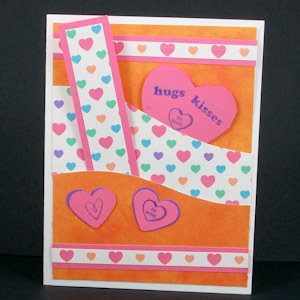 Bookmark: Cut a 1" by 4½" strip of pink cardstock and a ½" by 4" strip of Pastel Hearts ePaper. Glue the paper to the cardstock and decorate the reverse side as you like. 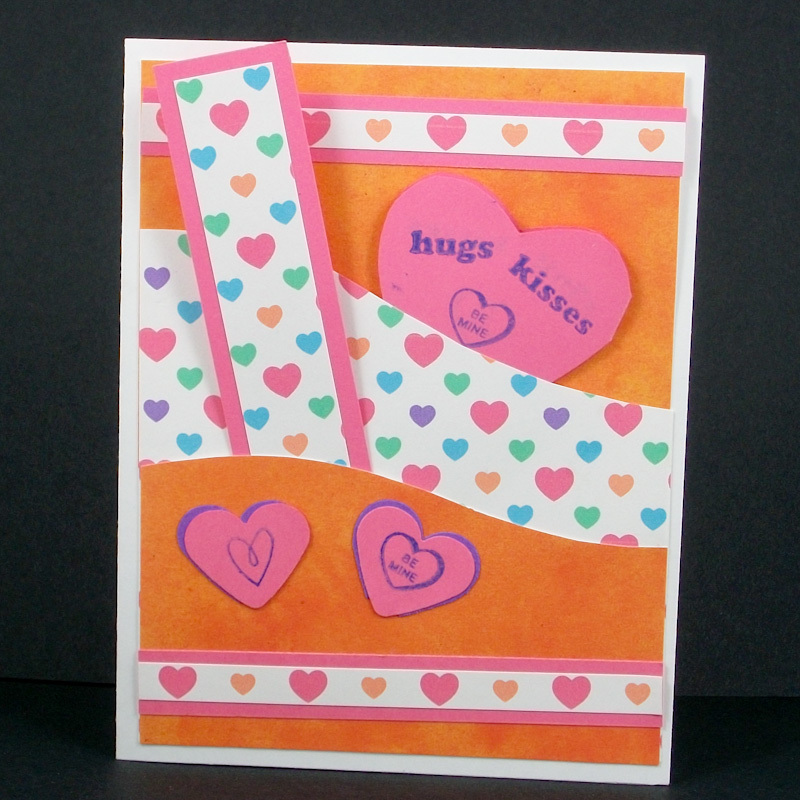 Mini-heart card: Cut a 2½" by 5" strip of pink cardstock. Fold the cardstock in half. Cut a heart shape, leaving about ½" of the fold uncut. Decorate the heart card with rubber stamps. To assemble card: Cut and glue the pockets following the instructions in Steps 3 and 4 of the Pocket Cards tutorial, using the orange cardstock as the background paper. Glue the pre-cut strips and punched hearts on the card front as pictured, and insert the bookmark and mini-card in the pockets. Prep work: Download White Hearts on Red ePaper and print on white paper. 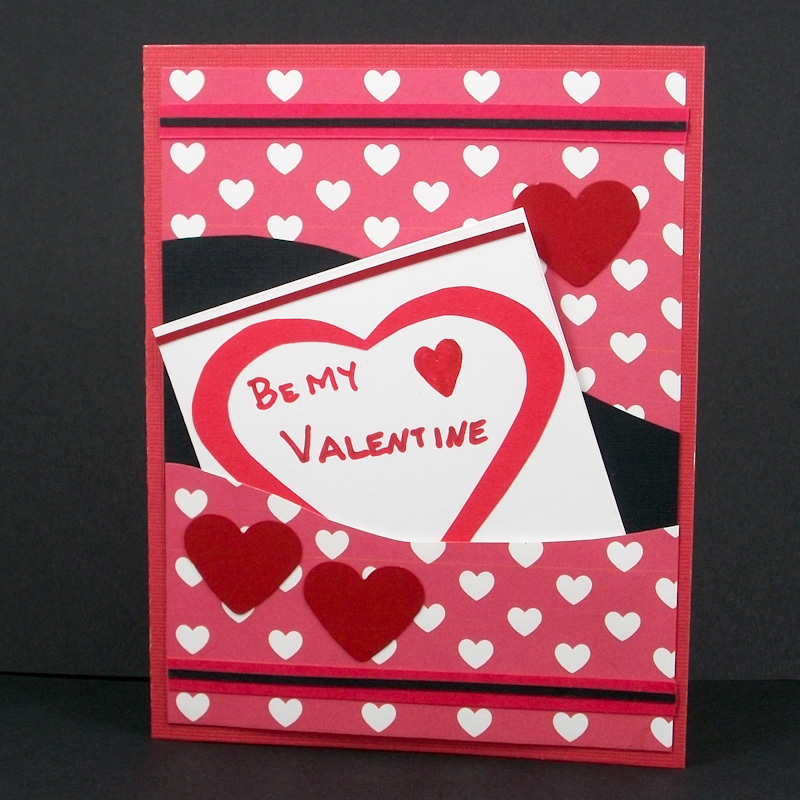 Cut a 4" by 5¼" rectangle from the White Hearts on Red ePaper and the black cardstock. Cut two ½" by 4" strips of red cardstock. Draw a thick black line down the middle of each red strip. Punch three hearts from the red cardstock. Mini-card: Cut a 3" by 6" strip of white cardstock. Fold the cardstock in half. Cut a 2" heart shape from the red cardstock and cut out a heart center leaving a heart-shape frame. Glue the heart frame to the mini-card. 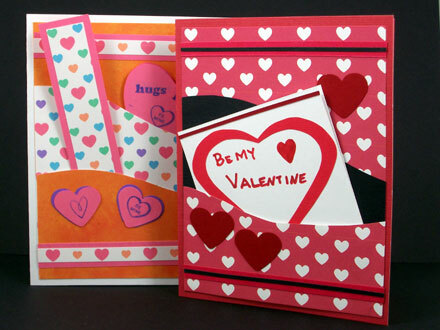 Decorate the mini-card with hearts and a message using the markers. To assemble card: Cut and glue the pockets following the instructions in Steps 3 and 4 of the Pocket Cards tutorial, using the White Hearts on Red ePaper as the background paper. 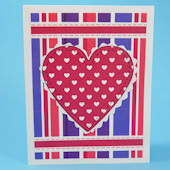 Glue the pre-cut strips and punched hearts on the card front as pictured, and insert the mini-card in a pocket. Put whatever you like in the other pocket. Related crafts: Looking for more pocket card ideas? Check out the Pocket Cards tutorial. Or for pocket cards the kids can make, see Kids' Pocket Cards. Related project: Other cards made with heart and striped ePapers are featured in the Faux Appliqué Heart Valentines tutorial.